should i installed an 38 jet? i am retired and not rich. I wouldnt use those kits unless the O rings are made of Viton. They are better and hold up with ethanol gas. https://www.randakks.com sells the kits. But you can use anything you want that is made for the GL1200. That kit should work well. Should last a few yrs. anyway. Sometimes you have to do with second best. And yes cost is a big factor. on my 84 and will see.By what i heard it is 50% the price but thats not Honda OEM i know.I called at the dealer and you know what,he said i am listed but i cannot have them anymore from Honda because the bike is too old so anyway i dont have much choice than going at jobber for my parts. Thanks for your email. This item will fit the models shown at auction description. Please bid if the description fits your bike. To find the item that you want, please go to our Ebay Store webpage (CLICK visit seller's store on the item) and at the top left search box search for example: CBR 600 2002 ( CLICK Titles & descriptions). your were speaking about bad orings,not Viton. I would say it was getting time to replace them. You could replace some of the o rings that come into direct contact with the gas. With Viton o rings if you can find them one at a time. I guess I should have asked if you use ethanol gas where your from. If you dont have Ethanol gas this wont make much difference. But Viton seals are the new and improved. The ones I have seen are brown in color not the usual black. here in the province of Quebec,regular gaz has ethanol thats a standard too my knowledge. so i should save some $. i spoke with them he said that it is becoming hard to have parts for these old GW. it is a gift i done too myself,during a trip too where i used to live almost all my life i had some news of 2 friends,both have cancer and dying.One of my best friend tolded me ,gervais if you have too do something do it NOW.When i came back home i spoke with my xyl and she said buy you this "toy" ,,,and i did. I am pleased too have found so much help here in the group for my project,if all goes well next summer (winter is coming soon here) i should have fun . Gef, the problem is you can get just about anything you need for these old bikes. Just need the $$ cause somethings are expensive. Somethings you have to get used also. I know, I retired from the US Air Force after 20 yrs. (age 40) in 1989. But had to get a real job (S) then. I retired at age 62 yrs.with our Social Security $$. I hate the C word, and so many have gotten it. I spend time working and playing with my 3 BMW bikes. If it would help I can order for you the "O ring kit here and send to you. Pay me half now and half later on. If you dont want too its OK. just trying to help ya out some. should i change my jet from the OEM #35 too the #38 ? i am not sure which one too buy? I have never jetted any of my bikes. I always figured the engineers knew more than I do. I have owned all those bikes under my picture here. Only one I can remember for sure is fuel injected is the 2003 K1200GT and still have it. The rest had Carburetors & not jetted, by me anyway. So you could ask the others here or Google. Some of the jets on mine had what looked like a screen or mesh inside them. I would hold them up to the Sun after cleaning and see this ## inside them. Some I had to clean a couple times. I assume they were to atomize the gas? 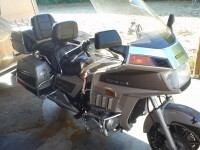 for the bike too pass the EPA test they were forces too be run lean,as my XT350 i add and when you buy them the dealer would suggest to change 1 or 2 jets so i heard abour the Goldwing of the "Driveability " something,,,,something about to be too lean,,. We change the slow jets #35 to #40 (or you can drill out the #35 using a #77 drill bit) and use either a #105 or #108 to fix the slow speed hesitation. Honda's service bulletin also changed the needles and slide springs ( we don't ) and they run great. Just make sure you get all the little passage ways cleaned. so i will changed ALL my #35 for the #40.
the #105 or #108 : the #105 is lean than the 108 and right now i have the 108 so i will buy some 105.